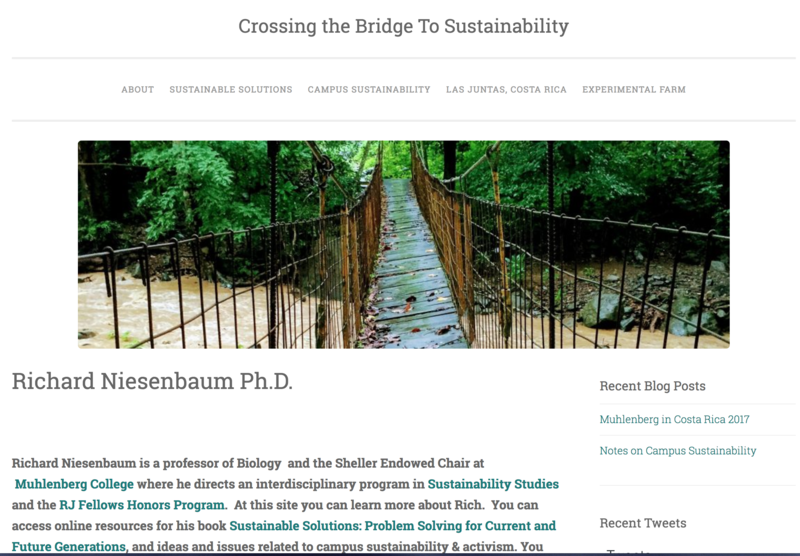 On his domain, Rich Niesenbaum is designing the space to include teaching, scholarship, and activism in a way that reflects the activist scholarship valued within the field of sustainability studies. The organization of the site nicely reflects the seamless interaction among teaching, research, and activism in sustainability studies. 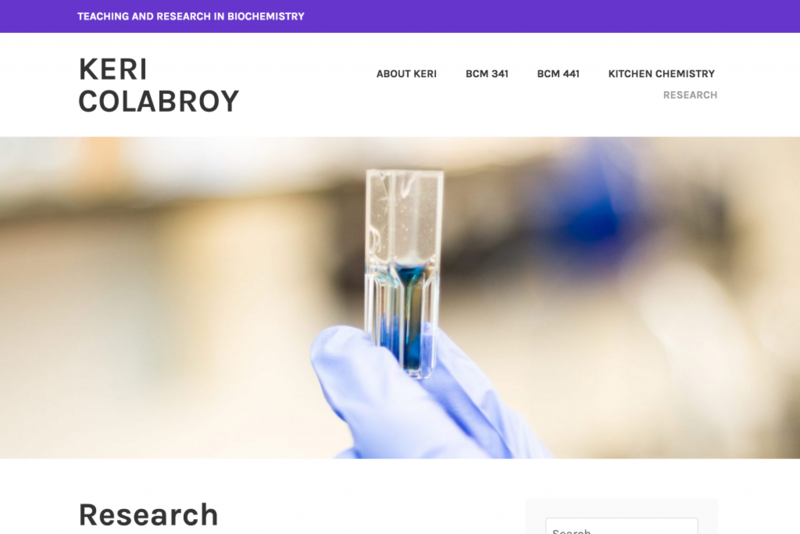 Keri Colabroy (Chemistry) is developing her domain as an active space for teaching and scholarship, but what really stands out here is the digital presence she is creating for teaching through research. 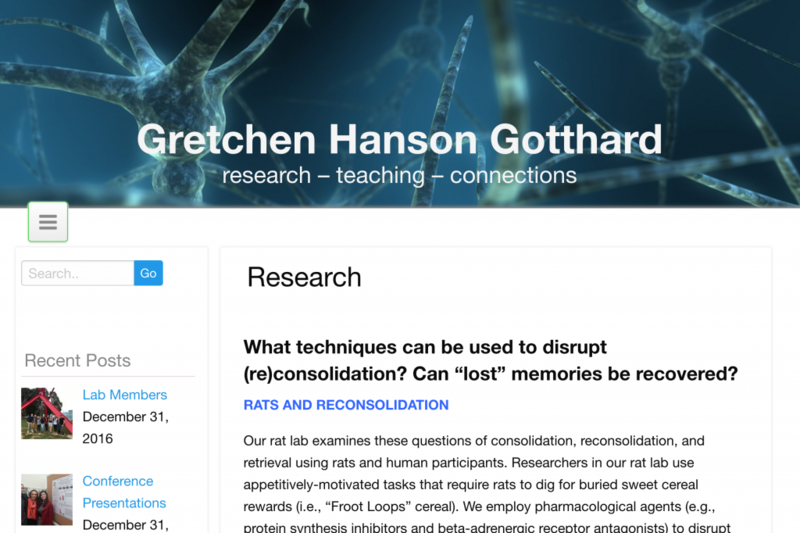 She’s foregrounding the value of undergraduate research in liberal arts teaching, and even blogging about the learning and practice of student research. In a variety of ways, a few of which are represented here, faculty at Muhlenberg are experimenting with the tools available within Domain of One’s Own to enrich, extend, and open the spaces of scholarship and teaching through a digital presence. What’s really exciting about the projects emerging from the Domain of One’s Own FLC at Muhlenberg are many ways that faculty are constructing their domain to highlight and promote the hybrid space where those practices of pedagogy and research meet in dynamic undergraduate liberal arts education. First, how far this work has come during the semester pilot of Domain of One’s Own–individually, on the respective domains of each participant, and also collectively, in terms of the experience and knowledge we are building that will guide our further work with Domains as we build a culture for critical and meaningful digital learning in the liberal arts at Muhlenberg. Second, we recognize that while Domain of One’s Own eliminate some of the barriers faculty previously encountered in trying to build a digital presence for their teaching and scholarship, significant barriers still remain. Identifying those barriers will be critical to sustaining and expanding Domain of One’s Own. To begin thinking about these barriers, we recommend reading Michelle Pacansky Brock’s recent article, 5 Invisible Barriers Preventing Change in Higher Ed. Finally, we recognize that the work of building a community of practice around Domain of One’s Own doesn’t end with the conclusion of this FLC. It is ongoing work and requires sustained commitment. There is no better example, we think, than the work of Chris Long, Dean of Arts and Letters at MSU. Chris has been blogging the philosophical life for more than a decade. Not only does he provide an example of sustained, open, reflective scholarship and engagement online at his site, he also sets the bar high for administrators and leaders whose work must support and empower faculty, staff, and students to establish and grow a digital presence. And, because no post on Domain of One’s Own would be complete without a reference to Jim Groom, over on his blog there is a recent post capturing a conversation with Chris and colleagues about the work they are doing at MSU. Listening to the dialogue reminds us that it takes a team to build a community of practice. The willingness of faculty to join together in collaborative learning with new tools involves no small degree of risk taking and we value that willingness. Part of what makes that openness to new learning possible is the engaged participation of members of the Digital Learning Team, Tim Clarke, Jenna Azar, and Jordan Noyes. The professional commitment they bring to sharing knowledge and expertise empowers and supports faculty and students working with Domains. More than anything, building a community of practice around Domain of One’s Own helps ensure that our commitment to this work remains rooted in the values of liberal arts teaching and learning at Muhlenberg.